French Open Television Coverage–Abominable! Watch the French Open Online! The French Open television coverage has been terrible. Right now, the men’s French Open semifinal between Rafael Nadal and fellow Spaniard David Ferrer is going on and it is not showing on television. I am watching the scores progress on ESPN here. You can also watch the French Open Online (see below)! On my cable provider, the television coverage starts at 11am USA midwestern time. Fortunately, this will probably be live coverage of the Novak Djokovic/Roger Federer semifinal, the one that we all really want to see. But seriously, there are four tennis grand slams a year and this is the semifinals and I have nowhere to watch this? The coverage currently is shared between ESPN and NBC. Also, there is this new network called The Tennis Channel which seems to be carrying all of the matches live, but I don’t get that channel so it’s irrelevant. These networks need to realize that it is a global world. Yes, they’ll re-run this Nadal match later today, but I won’t watch because I will already know the results. They made the same guffaw with the Olympics and I hope they don’t do that again! Television hates that viewers now switch to watching sports online, but, in this situation, they give us no choice. You can watch this Nadal-Ferrer French Open Tennis semifinals online here: Watch the Nadal-Ferrer online here. And, for all tennis matches, visit their tennis page here. The site is a bit annoying with a bunch of pop-up ads, but at least it allows you to watch the French Open live instead of some tape-delayed broadcast later when you already know the results. Ok, end of rant. Have a great Friday! PS: For the live and taped delayed French Open television coverage, visit this page. Watching the Superbowl and Making My Final Pick! Richard CummingsFrench Open Television Coverage–Abominable! 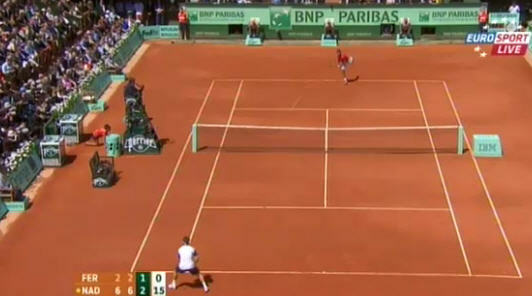 Watch the French Open Online!